The video offers potential inspiration for students to do their own videos about climate science and solutions. Excellent use of media to reach general public on some general issues of climate change. Students of middle school level or early high school may respond best. The informational screens have not been vetted by CLEAN for scientific accuracy. Resources provided in the lyrics have not been vetted by CLEAN, but the songs are relatively general in nature, so this shouldn't be an issue to use this material in class. The instructor might note that some of the resources cited in the lyrics document should be inspected for credibility. Might be construed as "cheesy" by high school students, but is appropriate and may be well-received by elementary and middle school students. Produced through the NSF and NASA funded Polar Palooza project. Advocating awareness and action to address climate change. Comments from expert scientist: The information is pretty basic, therefore the strengths are basic as well. 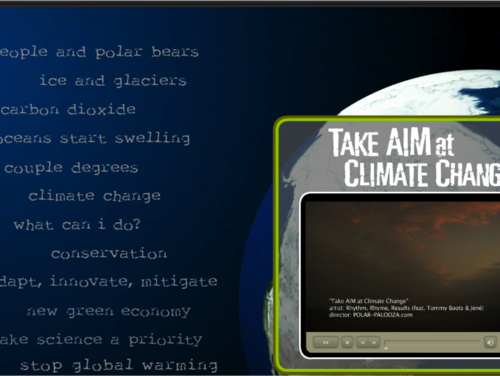 The video uses a unique form to inspire kids to learn more about climate change. The website also includes links to lyrics to the song that are annotated with the sources of the information in the lyrics. Various downloadable PDF files with the words of each climate rap song and links to additional resources explaining the lyrics are provided. There are a variety of platforms for downloading the video. The screen size is not adjustable.